Tell me again how law enforcement employees would NEVER engage in abuse of power. No, really - I'm listening. Crap on a cracker. Our President, only three weeks into the job, has managed to behave in such a fashion that a German newspaper has run an editorial about how Europe must defend itself against a dangerous U.S. President. 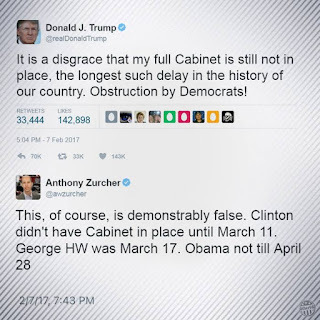 "It is literally painful to write this sentence, but the president of the United States is a pathological liar. The president of the U.S. is a racist (it also hurts to write this). He is attempting a coup from the top; he wants to establish an illiberal democracy, or worse; he wants to undermine the balance of power. He fired an acting attorney general who held a differing opinion from his own and accused her of "betrayal." This is the vocabulary used by Nero, the emperor and destroyer of Rome. It is the way tyrants think." Isn't one of the President's main jobs foreign relations? Bueller? Bueller? Anyone? Librarians step into the breach to help educate students about what constitutes "fake news" and what doesn't. Rock on, my brothers and sisters. Sharon Weeks talks about what young women may not know in an opinion piece. Hm, yes. I have noticed a trend among conservative women to sound like anti-suffragettes when it comes to issues facing women today, including pretty vociferous criticisms of women activists. I blame not only the complacency talked about in this article, but ignorance of the history of social justice. From the "ZOMGWTFBBQ could you be any dumber" file: After being pulled over by the Dearborn police, two braintrusts who describe themselves as open carry advocates decided to enter the local police station to make a complaint about the stop. In order to make some sort of point, Tweedledum and Tweedledumber came in carrying/wearing the following gear: a loaded AP-14 firearm, a rifle magazine containing 47 rounds, a loaded Glock 19 handgun with four additional magazines containing 66 rounds, body armor and ballistic vests, a ski mask, a gun belt, several pieces of camera equipment, an AR-15 rifle and an AK-47 style rifle. Of course the police were less than amused by this turn of events, and between them, the dumbasses were charged with breaching the peace, failure to cooperate with police, masking his identity by obscuring his face in the station, and obstructing police. Even the local open carry advocacy group has distanced themselves from these bozos, and who can blame them? This is the kind of crap that gives gun enthusiasts a bad rap among liberals. They're lucky the police didn't kill them on the spot. An Op-Ed from a Professor of Government asking some very pertinent - and uncomfortable - questions about our duty and responsibility when an authority figure directs us to do something immoral or even evil. These are the things that we must think about now. Not when they come up, but now. Examining our moral boundaries without having to do so under pressure is incredibly important and worthwhile. 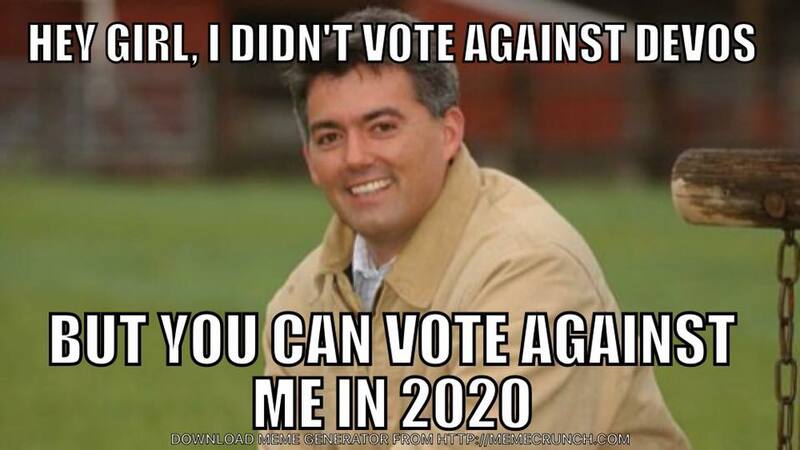 My bought and paid for Republican Senator, Cory Gardner, is scared of facing his constituents. Since he decided to vote "yes" on all of the President's cabinet picks regardless of their qualifications and experience, it's possible he has good reason to be. This is a light blue state, after all, in spite of this weasel's personal opinions. 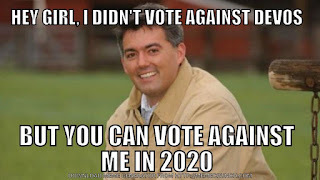 Or perhaps it's because if he holds an in-person Town Hall, he'll lose his ridiculous cover story of non-Coloradans being the ones who have flooded his office and e:mail with their opinions. Either way, I'll see him November, 2020. With bells on. Popehat: A group blog about whatever its authors want. Often its authors want to talk about free speech, liberty, criminal justice, the legal system and its foibles, and related issues. But Popehat isn't a law blog, and what is published there isn't legal advice. They also like to talk about games and what you might call geek culture. Spiegal Online International: Award winning German weekly news magazine with a distinctive reputation for revealing political misconduct and scandals. Seattle Times: Highly factual mainstream media source with a left center bias. Eau-Clare Leader-Telegram: Local mainstream media source with minimal political bias. WaPo: Mainstream media source with minimal partisan bias. The Baltimore Sun: Local mainstream media source with a left center bias. 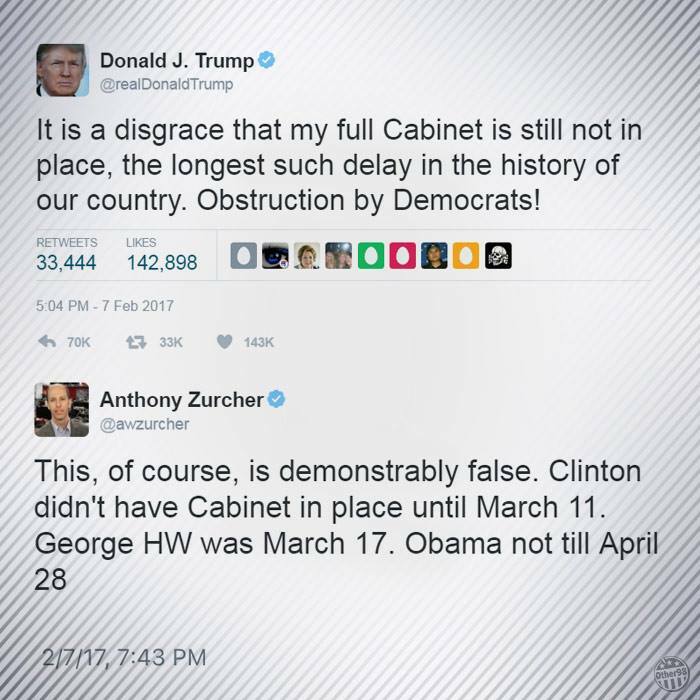 @realDonaldTrump: The childish, sociopathic rantings of our current President, whose acquaintance with the truth is casual at best. The Denver Post: Highly factual mainstream media source with minimal political bias. As an exercise to the reader, compare the two open carry morons and the result of their interactions with the police, to that of Philando Castile.